EPBOT: Art Attack: Double Takes! Wednesday, May 11th to help get us up to date with existing orders. 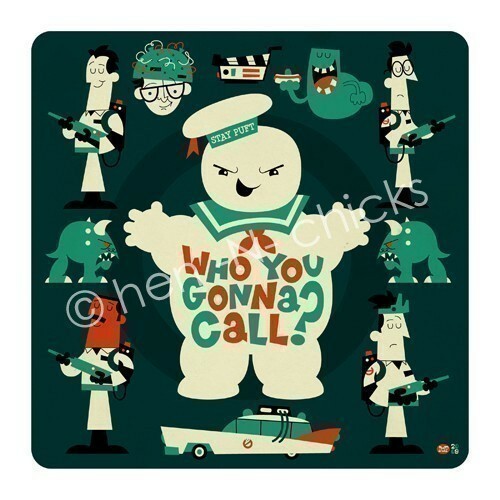 Thanks so much for your patience :)"
So looks like ordering from there is out for at least a couple of weeks. I just discovered that Etsy store yesterday and was planning on adding it to a comment here, only to find out you've already discovered it! 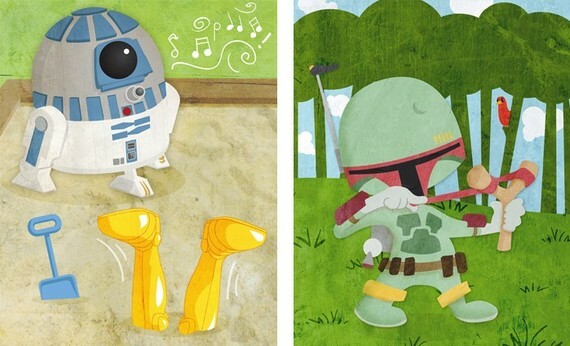 The little Star Wars ones are too adorable. I've had the baby star wars pics bookmarked for months...I'm already planning baby #2s nursery, since the hubs just got back from Afghanistan. Lol. Thanks for sharing! I looooove (good) fanart!! I've loved Gorgonist for a long time. I especially love the Peter Pan stuff because my family LOVES all versions of that story. My brother (31) is still convinced he is Peter Pan. These are fantastic! If you like art like this, there's a book called "The Art of the Disney Princess" I saw at Disneyland this weekend, and it's filled with gorgeous artwork like the things you posted, including great Art Nouveau pieces. Check out the book "The Art of the Disney Princess" - it has fabulous artwork like the ones you've posted, including quite a bit of Art Nouveau style. These that you posted are fantastic! My sister has been doing the art nouveau style lately. She uses dogs as her main subject lately though. I NEED that Doctor Who pic...kinda wish he'd made it with the 10th Doctor though. But who am I to complain it's The Doctor done in Art Nouveau that's enough for me! I love the last "fancy dress" one. If I have a little girl, that may just have to be hung up in her nursery! My sister is doing a series of the Disney Princesses as evil. Right now, her art is my favorite. I am going to pass out because Megan Lara has a Carl Sagan Katamari t-shirt. Carl Sagan (even though he's dead) is my #2 celebrity crush, and Katamari IS MY FAVORITE VIDEO GAME! Esmerelda is the most recent. It's also had a bit of media attention the past few months from nerdy sites. Check it out! @Wicked, Do you have a link? I'd love to see the Disney Princesses as evil! Hey Erica! Got your Art Nouveau Tenth Doctor right here! I'm loving the first "fancy dress" picture also. 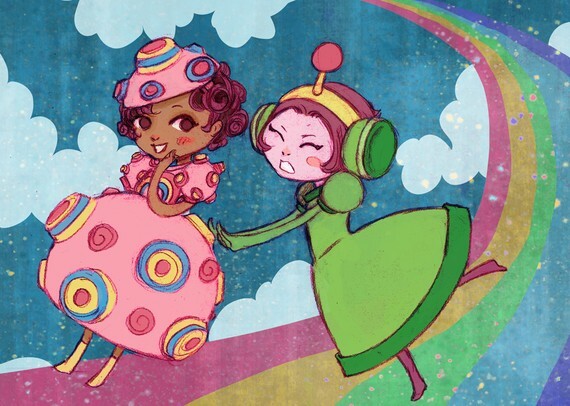 @Giana: Those 2 dresses are actually fashioned after the Katamari game. I've played that game for hours with my teenage son. Love it!! Wow, these are sooooo awesome!!! 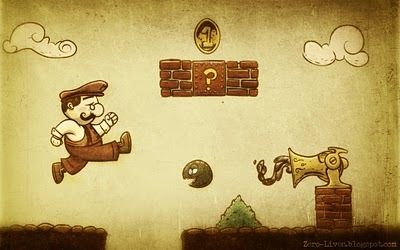 I need to start a geeky art wall in my house! Jen I don't know if you've featured these before, but I think you'll really like them. LOVE the Disney Princesses art. And YAY! 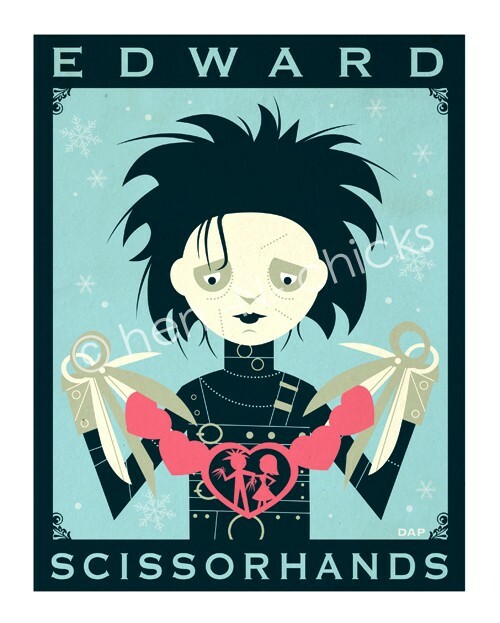 I've been looking for some unusual fan art of Tim Burton stuff for my new office design, so that Edward Scissorhands is PERFECT! Thank you! 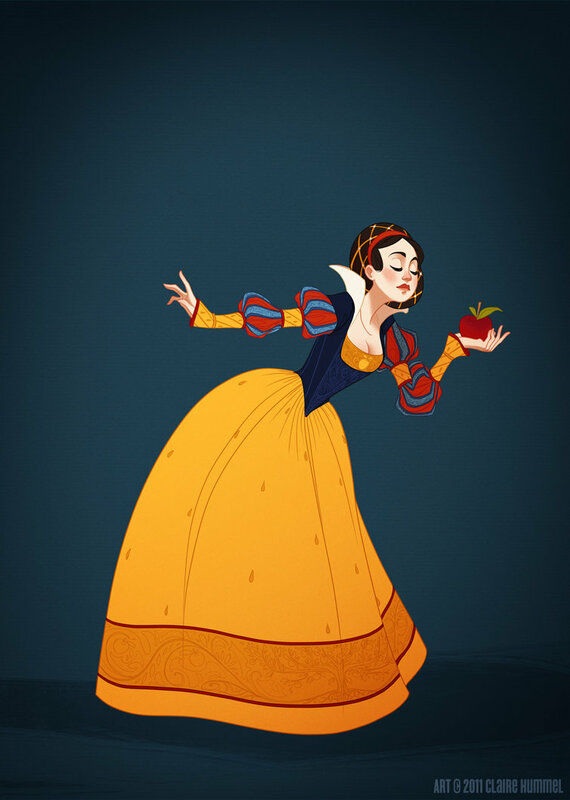 Do a quick search for Disney Princesses fan art and look what you find! 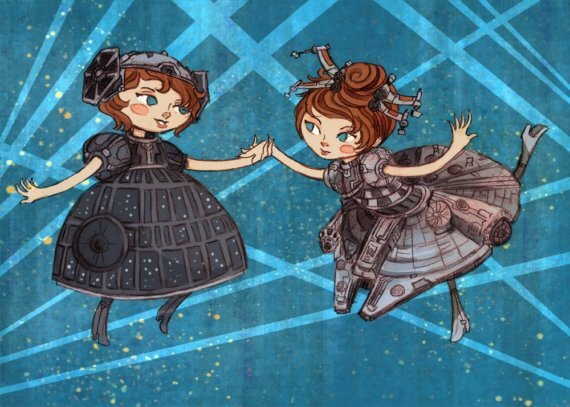 Steampunk Princesses! I LOVE Mulan's glasses! I've actually met Robin (The Gorgonist) personally, at the Asian Celebration (of all places) in Eugene. I own a print and some necklaces and pins of her art. I adore her! She was really tolerant with my constant returning to stare at the things in her shop that I couldn't afford. I hope everybody buys some of her work. But save some for me! Check this blog about Disney art, there's some very pretty art nouveau princesses! its a small world! i went to high school with the artist of the first drawing in this post!! You have to check out katiecandraw.com! She makes basically he cutest nerd art EVER. Wowza!! 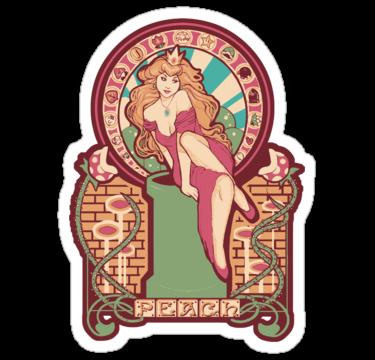 Megan Lara (of the Art Nouveau Princess Peach) is only 21 years old!! That makes it even more awesome! I love love love the Peach Nouveau t-shirt. 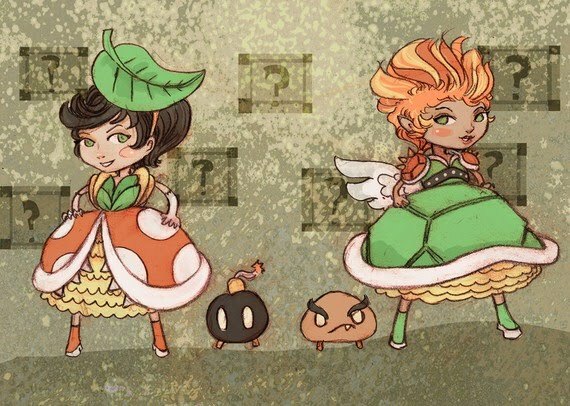 Am currently trying to persuade the boyfriend to purchase that and the Zelda one for me :p.
SO many of these prints need to be submitted to Teefury.com to made into t shirts! I LOVE the R2D2 sandbox one! AND the Doctor Who! This entire post is made of win <3 I love seeing reinterpretations of characters. So, I bought the Little Mermaid print, and it just arrived and I got it framed, and it looks wonderful! Thank you so much for sharing these lovely things.